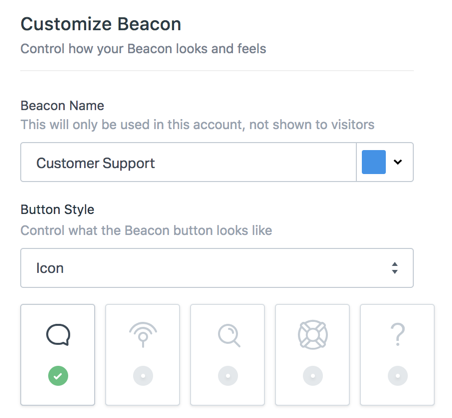 From the Customize tab, you can change some basic Beacon settings, or update a few advanced settings to get the look and feel of your Beacon just right. Let’s take a closer look at these settings. The Beacon name is for internal use only. Your customers do not see the name of your Beacon when using the Beacon. Drop in a HEX code or move the slider around to pick a color. You’ll notice that the color of the icon and text changes automatically based on your color range. We’ve done our best to chose a complementary color pallet, so you don’t have to change individual elements in the Beacon. Display the Beacon on the left or right side of the page. Most folks opt for the right side, but you might go with a left side embed if you have another widget in the right corner of the page. 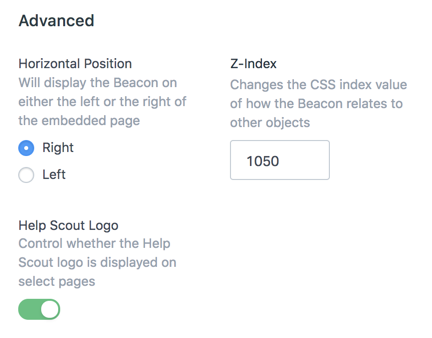 Adding a z-index value changes the stack order of Beacon so that it’s not bumping in to other elements on the page. There’s no minimum or maximum value, and you can use negative values, too. Plus plan customers can toggle Help Scout branding on or off. If this option is disabled for you, you’ll see a small Powered by Help Scout mark displayed on the bottom of your Beacon.